right. I was going to make linguine with clam sauce. With canned clams. Thats right. canned clams. I can feel your disdain seeping through the computer screen. But I will contend that the canned clams actually work better than fresh for sauce or dip purposes. Each bite gets some of that briny clam taste. And also, my mom would make me linguine with clam sauce every year for my birthday growing up. So there is the nostalgia factor, and as we all know, that nostalgia factor can be quite powerful. But incidentally, while I can make my mom’s linguine with clam sauce… it never is quite the same. So mom, next time I visit, i need you to make me linguine with clam sauce! So back to the clams. The canned clams. I decided to throw them a curve ball. I decided to turn them into a dip. Naturally! To prepare the dip: Heat oven to 375. Heat olive oil and butter over medium-low and add shallot and garlic. Saute until shallots are soft. Add the white wine and increase the heat. Reduce. Add the the can of clams, including the juice, as well as the lemon juice and lemon zest. Add the brie and cream cheese. Stir in the pepper and oregano. Bake for about 15-20 minutes, until the top is golden-brown. Stir and sprinkle more oregano, if desired. I feel about canned artichokes the way you feel about canned clams. Sometimes, they are just necessary. So intrigued by this dip! YUM! I love clam dip! And p.s. ~ I've tried and failed to make a linguine with clam sauce! So, once you get that recipe, please share!!! I agree with you! This is one instance where the canned stuff just works. Looks delicious. I'd never look down on someone for using a convenience product in a homemade dish! Sometimes canned or frozen foods are exactly what a recipe needs. Canned clams are really convenient and nothing is wrong with that. :-) I use both fresh and canned for cooking and I like them both. Your mom's clam linguini sounds so good. I have some dish that my mom cooks and I try to make, but they are not the same somehow. I love going back to Japan mainly to eat my mom's food. This dip sounds wonderful - I need lots of good bread for this dish. YUM! I should get me a can of clams soon. this recipe sounds too good to pass! I am not against canned food at all. The clam dip looks fantastic. I agree with you on canned clams. Preserved ingredients are always good I think and especially so in this dip! omg...I can't believe you posted clam dip! 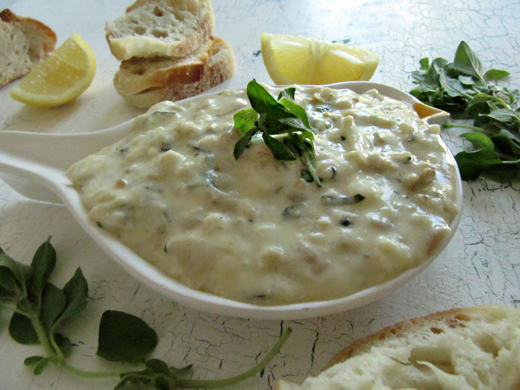 I've been meaning to post our family's recipe for clam dip ever since I started my blog 3 years ago...sigh. Yours is much different than ours (my grandmother's, really) as ours is cold and served with potato chips (MUST be with salty chips, nothing else will do)! I really can't wait to give your hot version a try - and with white wine and brie I know I'll love it! All I need with this dip is some nice hot crusty bread! I will definitely make you linguini with clam sauce when you visit. Last time I made it was when you came to visit last year. I seem to only make it when you come home. Miss you. Give me this dip and some crusty bread on a summer afternoon and I'd be one happy girl! This dip sounds interesting ,but looks creamy and delicious! How interesting!Never tried a clam dip before, but what a great idea to use it in this manner!Awesome Jenn!! You just put clams in a dip! I think I love you! You're my hero! I must have some of this dip! nothing wrong with canned when the results look this tasty!! yummy!